Of course this chart isn’t the cause, but it did get me heated over its horrific design. I’m becoming convinced that Nielsen doesn’t particularly care about making good design decisions, and they apparently don’t particularly value my feedback either. I can assure you, I’ve given them plenty. 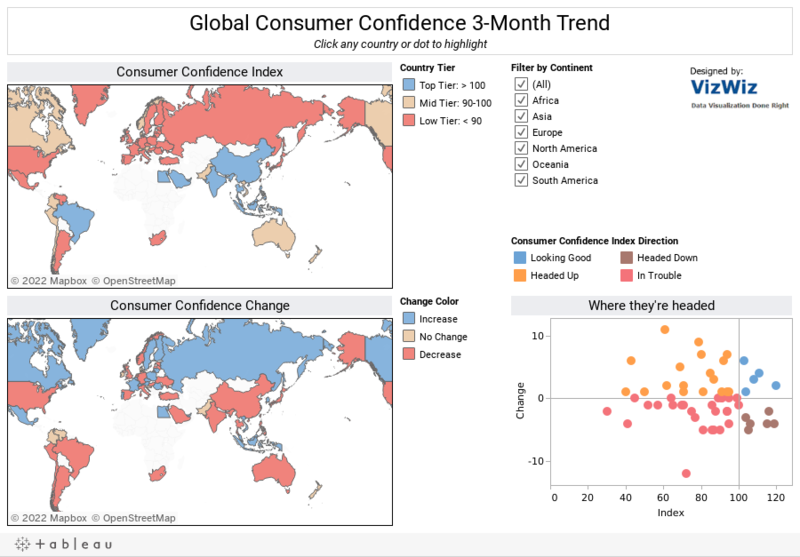 Here’s an alternative that I threw together in Tableau. Because we need to know how consumers’ feeling are trending; a country could have a high index, but are headed down (e.g. India and China), or a country could have a low index and things are looking up (e.g., South Korea and France). Those are two very different stories. Imagine how the politicians could spin this information. Click on the USA and you’ll see (when you hover over the circle that gets highlighted) that the United States is in trouble. Their CCI is 87 and it has declined –5 points. Uh oh! I challenge you to deduce any of that from Nielsen’s fan chart. This is good - You threw it together? Yes, it took about 20 minutes.